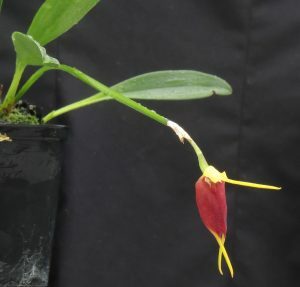 This is a medium sized masdevallia species with very long lasting large flowers that are produced successively over a very long period from a flower spike. It is not unusual for this orchid to be in flower for eight months of the year. The flowers are invariably pendulous and so we usually move this plant up onto a shelf when flowering. With such a long flowering period it now lives on that shelf. The species is found in cloud forests from 1500-1900m in Venezuela, Colombia and Ecuador and so plants are very at home in our Cool Americas section.